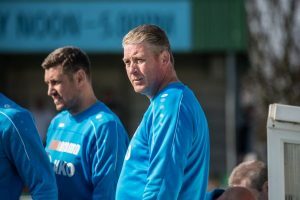 Alun Armstrong admitted Blyth Spartans’ huge win at Southport could have gone either way – believing it was a low-quality affair. Robbie Dale’s in-swinging corner on 52 minutes caught keeper Dan Hanford off guard in what proved to be the winner at the Merseyrail Community Stadium. Prior to kick-off, just three points separated the pair in the bottom four of the table but Dale’s only goal of the afternoon lifted Spartans three points above the relegation zone. And in what was a largely uneventful affair, the hosts came on strong in the closing stages with Peter Jameson rising to the occasion as Blyth recorded their first league away win since February. Speaking to BBC Newcastle after the game, Armstrong offered his honest assessment – although hopes the victory will prove crucial going forward. “I think it could have gone either way” told Armstrong. “No team deserved to win the game, to be honest with you, it was probably one of our worst performances of the season but Southport weren’t much better. “Speaking to their (Southport) manager afterwards – there wasn’t much quality in the game whatsoever. “The goal we scored – I think summed it up – after scoring direct from a corner. “It looked as though everyone was nervous out there because of the points that were at stake and the position we find ourselves in but we took the three points. Spartans travel to Guiseley on Tuesday before returning to Croft Park for Saturday’s crunch clash with FC United of Manchester. Armstrong has reiterated the quality he possesses in his dressing room and has called for his players to find their “self-belief” again. “We’re best when we’re on the front foot and today it was too direct, we were hitting it long straight away – we got sucked into their game. “But when we got the ball down, we played some good stuff but it just wasn’t anywhere near what we are capable of. “We’ve got the quality – they just need to have belief in themselves – half of our squad haven’t found themselves in this position. “It’s new to me as a manager to be down the bottom end like this – I’m learning as well and I’m trying to deal with it differently. “To be honest, I’m sure we’ll be fine but it’s just having that self-belief again.